I'd have to say since I've been involved in nail polish one of the most popular colors among many is green. People get excited about green shades. Any collection that introduces a green shade becomes famous and an instant lemming. San Francisco by most is medium true green shimmer. To me, it looks like nasty green bean casserole slime mucus mess. I actually like this color, but not on my nails. It just makes my hands look weird. I can't pinpoint it. Is it the shade on my hands or are greens just not my color? I know when I wear the color green I don't find it does anything for my coloring or very flattering? I'm a bit lost with green. If we were in a relationship on Facebook it would say "It's Complicated". I want to love green, but I just can't. Can you recommend a green you think would look good on me? Are there any colors that just don't work on you? I think it looks splendid on you! But yes, I also have trouble convincing myself that green is an acceptable color to wear on my own nails. 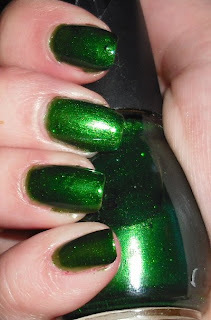 I would shell out the money for China Glaze Emerald Sparkle, that one looks spectacular! But...don't fight it, if your head and heart keep telling you that you don't like green on your nails, just don't do it! =) But really, I think this shade is really really pretty. I think this is quite pretty on you but I understand the "its complicated" feeling I feel that way about purples, I just don't like them on me what so ever. I honestly believe that everyone can rock green nail polish...it's all about picking the right shade. I think that some of the darker, more blue-based greens would look gorgeous on you. Like RBL Recycle, Nfu-Oh #569, Orly Enchanted Forest, Illamasqua Rampage, Nubar Forest, Nubar Greener, Zoya Veruschuka, Zoya Envy, OPI Here Today, Aragon Tomorrow, BB Couture Green Goblin....colors like that would be your friend, I imagine. Hmm i've picked this polish up many times at Walgreens and thought about getting it but always decide against it... I might just end up getting it lol. I dunno i kinda like it but kinda don't... I feel like it would be a good creme shade, but it's not a creme. hmmm! I don't think that greens look bad on you at all though! You should maybe try Essie's new green creme Pretty Edgy though :) i know that shimmery/frosty greens usually don't work on me but I love creme ones! You all may have a good point...it may just be in my head that green doesn't look good on me. Aggie- You're right. I think some bit of it is in my head, but I also don't HAVE to love green. Jessica- Yeah it's hard because you really want to love a color but you just can't! Caitlin- You know the more I see that new Essie shade the more I want to try it. It does look pretty. I like that color. I guess I don't know what to recommend for you...if you go for Nubar at all, try something from their Greener collection as it has various shades of green so one might fit. I don't make it a habit to wear reds and not many pinks mostly because I don't care for the color but I also don't think its flattering on my hands.